The Sun, the star at the center of our solar system, is an average-sized, middle-aged star. It is a gas ball made mostly of hydrogen and helium, with a small amount of carbon, nitrogen, oxygen, and trace amounts of heavy metals. The Sun is roughly 865,000 miles (1,392,000 kilometers) in diameter, about 109 times the diameter of Earth. The Sun, so large that more than 1.3 million Earths could fit inside of it, accounts for about 99.8 percent of the mass of the solar system. Because the Sun is a gas ball, the rate of its rotation about its axis varies—it spins faster around its equator than around its poles. At its equator, it completes one rotation in about 25 Earth days. At its poles, one rotation takes place about every 35 Earth days. The Sun's surface gravity is almost 28 times that of Earth. Its gravitational attraction holds all the planets, comets, and other solar system bodies in their orbits. The Sun's core is located about 312,000 miles (502,000 kilometers) below the surface. With a diameter of 240,000 miles (386,160 kilometers), the core accounts for only about 3 percent of the Sun's volume. Yet it is so dense that it contains about 60 percent of the Sun's mass. The temperature in this dense area is an incredible 27,000,000°F (15,000,000°C). It is here that nuclear fusion, the Sun's heat-producing process, takes place. Under tremendous pressure and heat, two hydrogen nuclei are combined to form one helium nucleus, releasing a tremendous amount of energy in the process. The amount of helium found in the Sun indicates that the fusion of hydrogen to helium must have been going on for about 4.5 billion years. Scientists estimate that the Sun has enough hydrogen to continue producing energy for about 5 billion more years. Chromosphere: Glowing layer of gas that makes up the middle atmospheric layer of the Sun. Convection zone: Outermost one-third of the solar interior where heat is transferred from the core toward the surface via slow-moving gas currents. Core: Central region of the Sun where thermonuclear fusion reactions take place. Corona: Outermost and hottest layer of the solar atmosphere. Flare: Temporary bright spot that explodes on the Sun's surface. Granules: Earth-sized cells covering the Sun's surface that transfer hot gas from the Sun's interior to its outer atmospheric layers. Nuclear fusion: Nuclear reactions that fuse two or more smaller atoms into a larger one, releasing huge amounts of energy in the process. Photosphere: Innermost layer of solar atmosphere that constitutes the Sun's surface and where most of the visible light is emitted. Plages: Bright hydrogen clouds on the surface of the Sun that are hotter than their surrounding area. Prominence: High-density cloud of gas projecting outward from the Sun's surface. Radiative zone: Central two-thirds of the solar interior. Sunspot: Cool area of magnetic disturbance that forms a dark blemish on the surface of the Sun. Enveloping the core is a region called the radiative zone, in which heat is dispersed into the surrounding hot plasma (a substance made of ions [electrically charged particles] and electrons). Above the radiative zone is the convection zone, where heat is carried toward the surface by slow-moving gas currents. The temperature at the surface of the Sun is about 6,000°F (3,315°C). The atmosphere of the Sun consists of three general layers: the photosphere, the chromosphere, and the corona. Since these layers are composed of gases, no sharp boundaries mark the beginning of one layer and the end of another. Photosphere. The photosphere, the innermost layer of the Sun's atmosphere, is a few hundred miles thick and has a temperature of about 10,800°F (6,000°C). 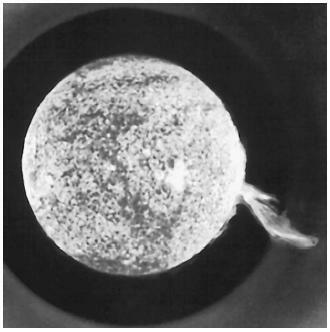 When gas currents in the convection zone reach the photosphere, they release the heat they carry, then cycle back toward the center of the Sun to be reheated. The photosphere is covered with cells in which this heat transfer occurs. 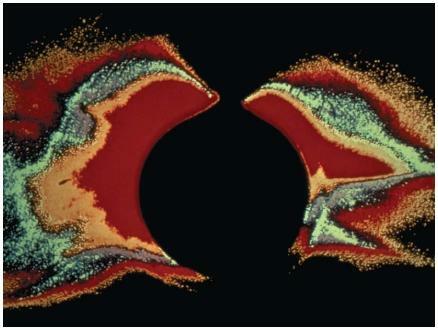 These cells, called granules, are Earth-sized chunks that constantly change size and shape. Another feature of the photosphere is the presence of sunspots, dark areas that may exceed Earth in size. A sunspot has two components: a small, dark featureless core (the umbra) and a larger, lighter surrounding region (the penumbra). Sunspots vary in size and tend to be clustered in groups. They are magnetic storms caused by the transfer of heat stirring up the weak magnetic field lying beneath them. They are dark because they are 2,700°F (1,500°C) cooler than the surrounding area. Chromosphere. Beyond the photosphere lies the chromosphere, another region through which heat and light pass from the inner layers to space. It is around 1,200 to 1,900 miles (1,930 to 3,060 kilometers) thick. At its greatest distance from the Sun's surface, the chromosphere has a temperature of about 180,000°F (100,000°C). This atmospheric layer is punctuated with plages and flares. Plages are bright patches that are hotter than their surroundings. Solar flares are sudden, temporary outbursts of light that extend from the outer edge of the chromosphere into the corona, the next layer. They produce an incredible amount of energy in only five to ten minutes. A flare can accelerate solar particles to nearly the speed of light. The largest flares generate enough energy to supply the United States's needs for 100,000 years. Corona. The chromosphere merges into the outermost part of the Sun's atmosphere, the corona. The weak light emitted by the corona (about one-half the light of a full moon) is usually overpowered by the light of the photosphere and therefore is not detectable. During a solar eclipse, however, the Moon blocks the light of the photosphere and the corona can be seen shining around it. The corona is the thinnest part of the atmosphere. It consists of low-density gas and is peppered with prominences. Prominences are high-density clouds of gas projecting outward from the Sun's surface into the inner corona. They can be more than 100,000 miles (161,000 kilometers) long and maintain their shape for several months before breaking down. The corona extends out into space for millions of miles. As its distance from the Sun increases, so does its temperature, to an incredible 3,600,000°F (2,000,000°C). Astronomers believe that the corona's energy may emanate from spectacular pillars of fiery gas near the Sun's surface, at the bottoms of looping arches of magnetic fields (like those produced by a bar magnet) that stretch for hundreds of thousands of miles above the surface. Hot gases seem to explode upward along the magnetic fields and heat the rest of the corona. At its farthest reaches, the corona becomes the solar wind, a stream of charged particles (mainly free protons and electrons) that flows throughout the solar system and beyond. When the solar wind reaches Earth, the protons and electrons are flowing along at speeds up to 620 miles (1,000 kilometers) per second. Little of the solar wind reaches Earth's atmosphere because the charged particles are deflected by the planet's magnetic field. The particles that do get through spiral down toward the north and south magnetic poles where they collide with oxygen and nitrogen molecules present in the upper atmosphere. As a result of this collision, the molecules become ionized (electrically charged) and emit the shimmering, green or red curtains of light known as auroras (aurora borealis in the Northern Hemisphere and aurora australis in the Southern Hemisphere). on its visible surface. Sunspot activity generally follows an 11-year cycle from the time when the number of sunspots is at a maximum to the next. During Solar Max or solar maximum, the Sun's magnetic north and south poles flip or reverse. Also accompanying the variations in sunspot number are corresponding changes in prominences and flares. An increase in all of these solar activities increases the solar wind and other matter ejected by the Sun. This, in turn, increases the appearances of auroras in Earth's atmosphere and also causes radio communication interference. In April 2001, at the peak of the Sun's solar activity cycle, a solar flare erupted from the surface of the Sun near a giant sunspot that was 14 times as large as Earth. According to scientists, the flare was more powerful than any detected in the previous 25 years. Most of the blast was directed away from Earth. Still, two days after the flare erupted, luminous arcs, streamers, veils, rays, and curtains of light were seen in the night sky above Earth. Fortunately, sensitive electrical and communications systems were spared. About 5 billion years from now, the Sun will have used up all of its hydrogen fuel and will swell into a red giant, taking on a reddish color as its temperature begins to drop. Because the Sun will shed a great deal of its mass, Earth may be lucky enough to escape being swallowed up in its outer atmosphere, a 3,000°F (1,650°C) plasma. Even though Earth's orbit will be pushed slowly out into the solar system, the oceans will boil off, the atmosphere will evaporate, and the crust may melt. Earth will be a burnt ember. Eventually, the Sun's atmosphere will float away, leaving only a glowing core called a white dwarf that will cool for eternity. Thank you so much for this web site. I needed information for my class and it was provided.